According to one carton manufacturer, Millennials are canning soup. Andy Warhol’s famous Campbell’s Soup cans may find themselves extinct in a few decades. This is because Millennials overwhelmingly prefer boxed cartons over cans, according to Tetra Pak, one of the world’s leading carton manufacturers. The study pinpoints several reasons as to why millennials are so partial to cartons over cans. The biggest one was health, both personal and environmental. 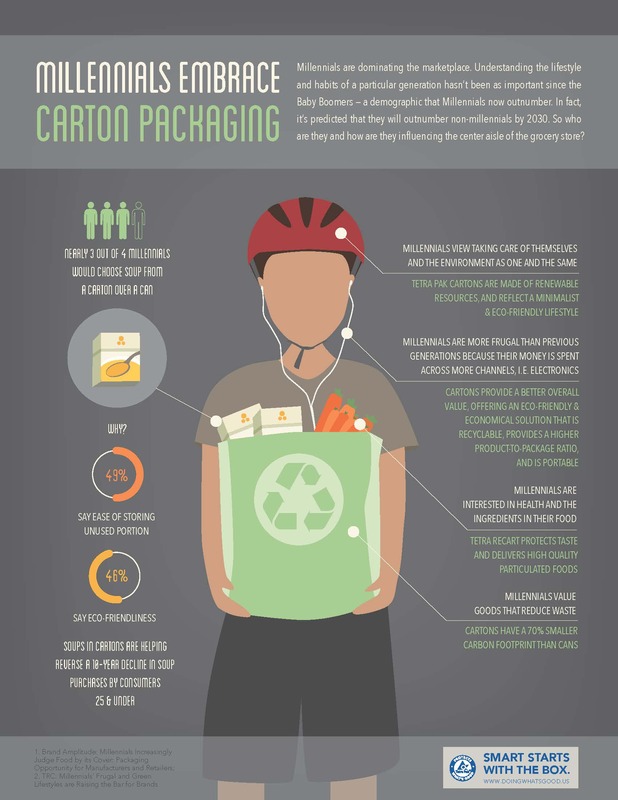 According to the report, “Millennials view taking care of themselves and the environment as one and the same” – which would lead them to prefer cartons which are made of renewable resources and have a 70% smaller carbon footprint. There’s also mention of taste. I’m sure this is difficult to verify, but it seems reasonable that cartons are able to protect taste and include higher quality ingredients than an aluminum can could. Last but not least, there’s the convenience factor: nearly half of Millennial survey respondents said that being able to easily save the unused portion of their product was the primary reason they preferred cartons over cans. Tetra Pak’s study suggests that this trend will intensify in coming years, as the massive Millennial generation overtakes the Baby Boomers and becomes the largest single age demographic in the world. The study also claims that carton-based soups are leading a rise in soup sales for consumers aged 25 and under (soup sales have been steadily declining in this category for the past ten years). If Tetra Pak’s analysis is accurate, then aluminum soup cans might be headed the way of chewing gum, which has also suffered from the scorn of the millennial set in recent years. Its really a great post. Thanks, sir. Aah, pop art and Andy Warhol. Classics! Mmmmmm. Kids today. HA! Good stuff. It’s kinda cool that pop art never dies. Soup cans. Andy Warhol. Icons that live forever. Delicious! lol. But seriously, you hit the nail on the head. Ok… so let’s get this party started. #seriously. Kids and cops. Worst combo on earth. So what’s next? Soup in origami cups? I bet most 20 somethings don’t even own a can opener! I wanna be a millenial again!